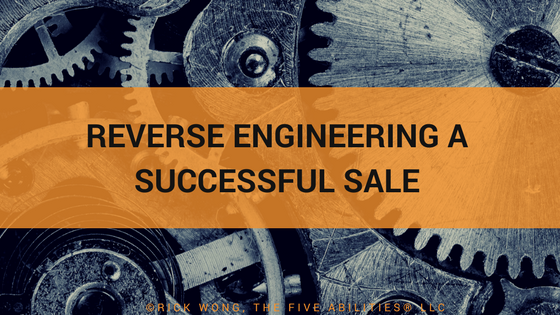 In my book Winning Lifelong Customers with The Five Abilities® I talk about that reverse engineering process. I led a sales effort that won HP a large project for a new factory automation system at Boeing. It was the largest manufacturing project HP had won that year and I was asked to present a “win report” to US sales leaders. As with any large sale, we had unique hurdles but that wasn’t what HP’s leaders wanted to know. Our SVP of Global Accounts, wanted to know the generic things we did that others could repeat. “It has to work everywhere.” Specifically, he asked for me to be “clever and catchy” to help others learn our habits. It was lucky for me because it forced me to reverse engineer that and other wins to determine the key things we did every time. I learned that there are just five things you do that cause people to buy from you. To address the “clever and catchy” request, I turned those five things into The Five Abilities®. VISABILITY – Being seen in the right way, by the right people at the right time. CREDABILITY – Showing superior knowledge about your industry and that of your customers. VIABILITY – Verifying the needs and readiness of both the seller and buyer. CAPABILITY – Delivering on the personal reasons people make business decisions. RELIABILITY – Always being accountable when the unexpected happens. October is Breast Cancer Awareness Month and I’m asking everyone to support Making Strides Against Breast Cancer to help many women with early detection and treatment. As an example of how simple The Five Abilities is, here’s why I’m asking you to give to the cause. VISABILITY – Breast cancer will afflict or affect someone you know, if it hasn’t already. CREDABILITY – Currently, more than 1 of 8 women will have this disease in their lifetime. 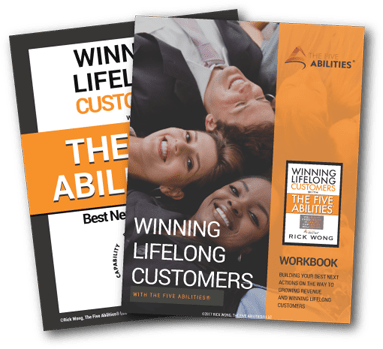 VIABILITY – Helping is easy. Buy my book for as little as $4.99 or give directly to Making Strides Against Breast Cancer. CAPABILITY – Like me, you want this to stop. Your friends and family who have suffered or will suffer, need your help. RELIABILITY – We aren’t responsible for the disease but we are accountable for helping to fight it. During the month of October, we’re supporting Breast Cancer Awareness by donating all royalties from book sales to Making Strides Against Breast Cancer. My mother, four cousins, and too many friends have been afflicted by this disease and we need to find the cure. I know there are many unfortunate disasters that are calling for your generosity so I’ve reduced the price of the Kindle book from $9.99 to $4.99. I really appreciate your support of this important cause.